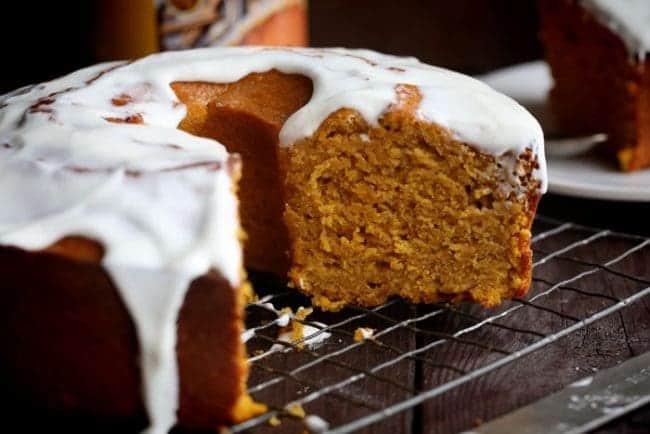 This amazing Pumpkin Dessert is a Pumpkin Pound Cake recipe paired with a lovely Cream Cheese Glaze. While both amazing on their own, the cream cheese glaze really takes this dessert to a whole new level of amazing! If you love Pumpkin Cakes make sure you check out my Pumpkin Cheesecake and Pumpkin Waffles! 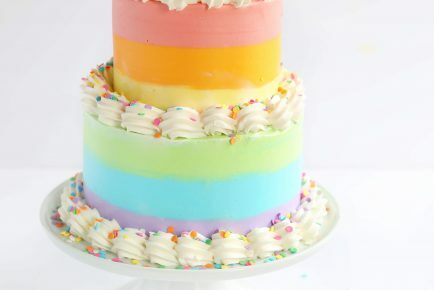 Let’s start with that cake! It’s technically called a pound cake but doesn’t technically follow pound cake rules. The definition of a pound cake is “a rich cake containing a pound, or equal weights, of each chief ingredient, typically flour, butter, and sugar”, and this recipe does not meet that criteria. However, it does have the amazing density of flavor and texture that a pound cake does. I absolutely love fall baking. I love the subtle smell of pumpkin spice and the slight crisp in the air. I love when the oven warms the whole house and you don’t need to turn on the heat. Is there anything not to love about fall? This recipe happens to one of my favorite ways to usher in fall baking. I serve this glorious Pumpkin Pound Cake with a Cream Cheese Glaze, but I have to admit, I love how this “naked” cake looks. Those deep, rich pumpkin tones with a glistening amber crust… it was hard to not just dig in! This glaze is totally customizable, but I do encourage you to try it as-is first. However, if you feel like your glaze is too thick feel free to add more buttermilk to create the consistency you want. If you don’t happen to have buttermilk on hand, you can use whole milk in place of buttermilk. 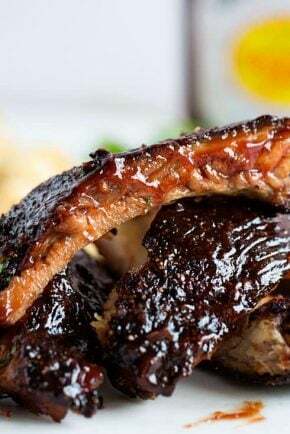 This will create less depth-of-flavor and will result in a sweeter glaze. For this recipe, I made the glaze first so that it could cool at room temperature, but I have to warn you. That’s dangerous. You will want to grab a spoon and dig in! 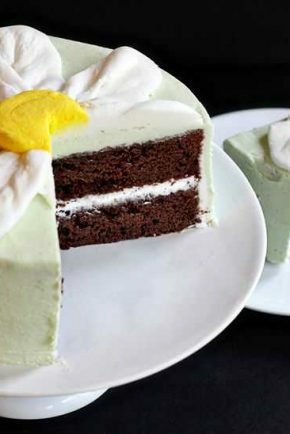 After adding the glaze and watching it spill beautifully over the sides of the cake, you get to cut into it. I have to admit, it was quite a moment!! The cake was still slightly warm in the center so wisps of steam escaped and made their way around the room making sure to visit every nose! I hope you enjoy this beautiful Pumpkin Dessert with Cream Cheese Glaze as much as we do! 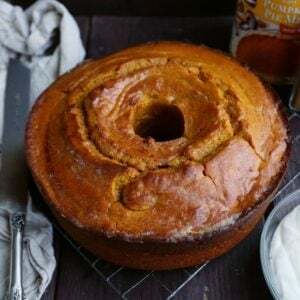 Dreamy Pumpkin Cake with the perfect Cream Cheese Glaze! This is the Pumpkin Dessert you want to make this fall! Combine all ingredients in a stand mixer until fully incorporated. (About 5 minutes. You want to get all the lumps out) Set aside. Coat a 10-inch tube pan with cooking spray. Place granulated sugar, brown sugar, and 1/2 cup butter in a large bowl; beat with a mixer at medium speed for 3-5 minutes or until well blended. Combine flour, cinnamon, baking powder, baking soda, and salt in a bowl, stirring well with a whisk. Bake at 350° for 55 minutes or until a wooden pick inserted in center comes out mostly clean (a few crumbs are great!). Cool in pan for 10 minutes on a wire rack. Remove from pan, and cool completely on wire rack. Drizzle cake with glaze. If you drizzle while the cake is warm the glaze will soak into the cake more. 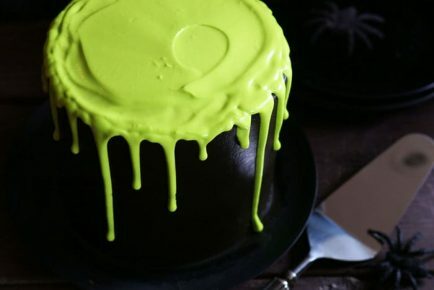 If you drizzle when the cake is cool, the glaze will appear thicker. 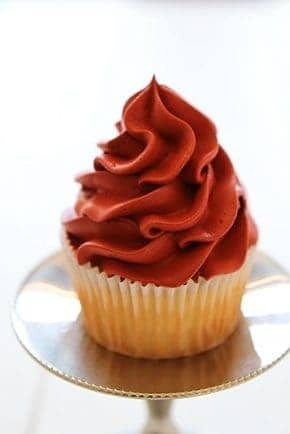 Love desserts? Check these out! Why? Its a dessert. Not every recipe does not need to be made keto friendly. Don’t you just love baking in the fall? 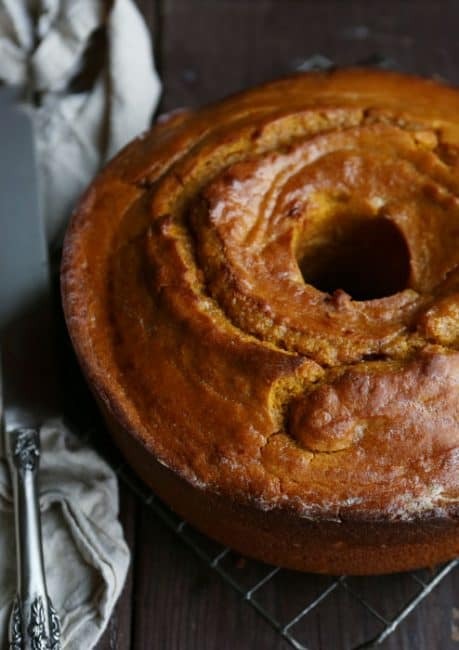 Made this delicious pumpkin pound cake yesterday, and it is already gone. I have been told I must add it to my recipes and make it again soon. I did not have a tube or bundt pan, so I made it in a sheet cake and reduced baking time. Yes not as pretty this way, but it sure did not affect the taste. I’m going to make this and thank you for sharing. I was wondering in the written recipe you put the pumpkin in before the flour not after. Which way is the best? Thank you. i CAN’T WAIT TO TRY YOUR PUMPKIN DESSERT POUND CAKE! I was wondering when the best time is to incorporate the pumpkin. Before the flour and buttermilk or have it as the last step in making the batter? Your recipe and video are different. Thank you. I am new to your blog. What an amazing collection you have here! I was drooling over the caramel recipes, but I couldn’t find a recipe for a caramel sauce. 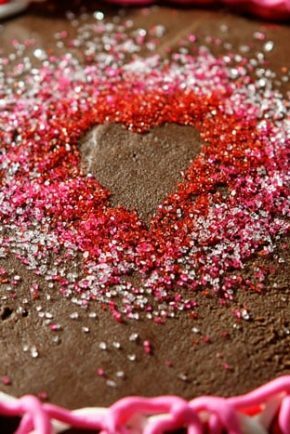 Do you have a certain brand you purchase, or will you share a homemade recipe with us? Pleeease. Thank you – and I am really enjoying your site. Hi ….. I can not use pumpkin…allergy…can I use squash? I noticed the recipe specifically calls for pumpkin pie filling (not purée), but in the video she says purée. I know pumpkin pie filling already has the spices added. Please clarify. Thank you. It looks amazing. Can we use puree ? 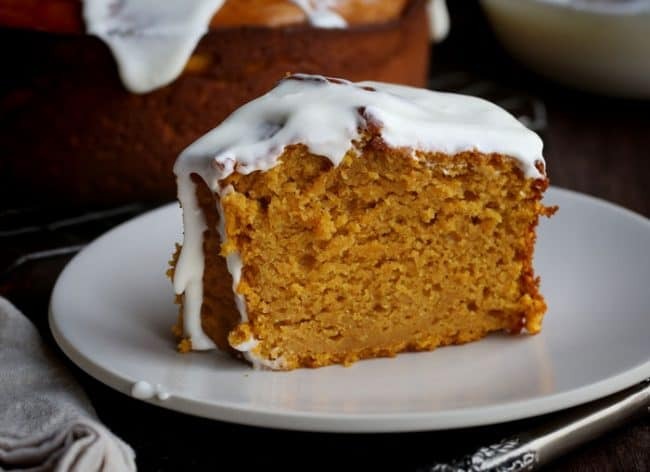 I’m so interested in this recipe and wanted to use pumpkins which are available in abundance here in India (we don’t really get the canned pumpkin pie filling here:,(. ) So any tips for me sing a real ripe pumpkin in this recipe would be appreciated greatly!!! Can you use 2% milk instead of buttermilk. Well, I followed the recipe exactly and the cake was so very dense. Could not really enjoy it, even with whipped cream. It was fine when it was still warm, but the next day it just changed.